Sun, wine, and seafood. Those have been staples so far in my summer this year. I never used to cook seafood because I was always scared I’d ruin it or overcook it but this year my confidence is a little higher in the kitchen and I’ve been whipping up all sorts of seafood dishes. Seafood during the summer is key because you can create lighter dishes that don’t weigh you down in the heat. 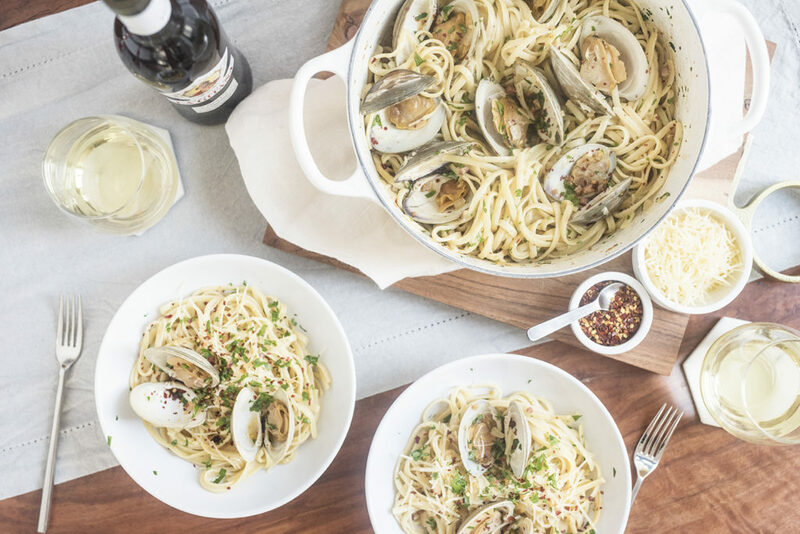 For this recipe I busted out my dutch oven (my favorite kitchen item ever, I highly recommend investing in one) and put together a classic clams and linguine recipe! There’s not a whole lot to this classic dish so make sure you use quality ingredients.I recently purchased a fresh parsley plant which is growing nicely on my windowsill so I was excited to use it. To start, I sautéed some pancetta then added in onion, loads of garlic, and a little manzanilla sherry to create a flavorful base. I then added in my clams with a squeeze of a fresh lemon. Covered the pot and let it steam until all the clams opened up. Added in the pasta with a few other ingredients and in no time it was ready! 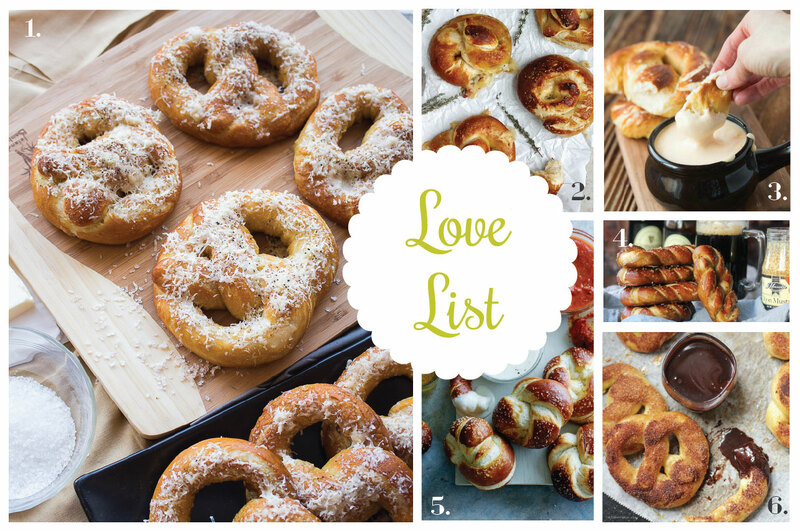 Always a plus when the recipe is quick to put together. When it was time to sit down and enjoy, I had extra sherry left over so I poured myself a chilled glass (or two) and thought it paired with the dish very nicely! Manzanilla is a lighter sherry with a bright straw color. 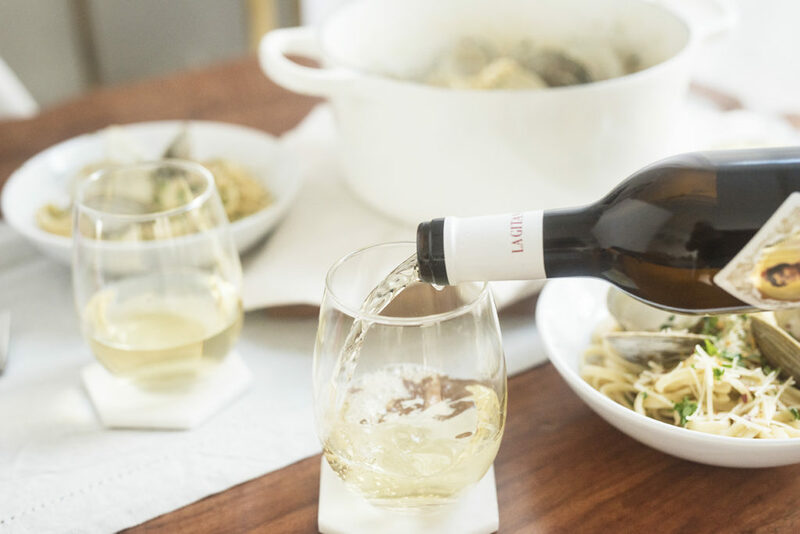 It pairs really well with seafoods but it can also go well with cheese and charcuterie if you are doing wine night at home! 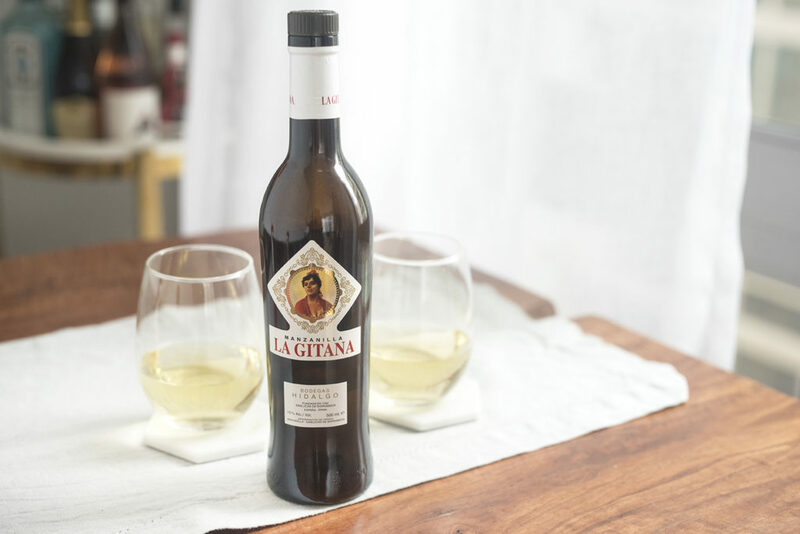 The brand of manzanilla you see in the photos here comes from a family owned winery called Bodegas Hidalgo la Gitana. It’s dry, light, and crisp. I would definitely recommend chilling it before serving. 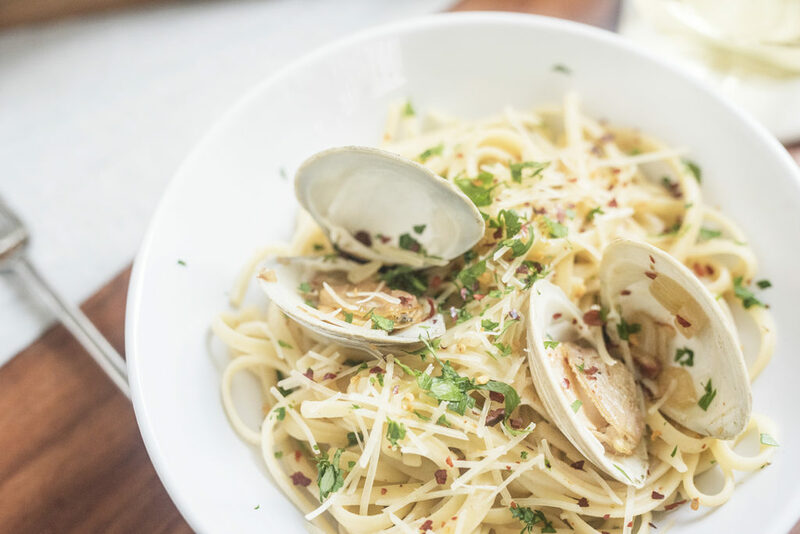 What’s your favorite seafood dish and what do you pair it with? Place a dutch oven or large sauce pan on the stove over medium high heat. Add in the pancetta and fry until it starts to turn golden brown. Add in the garlic and onions. If there isn't enough fat from the pancetta to coat the onions, add in 1 tsp of olive oil. Add in red pepper flakes, the juice of half a lemon, and the manzanilla sherry. Scrub the clams clean. Then place them on the bottom of the dutch oven in an individual layer. 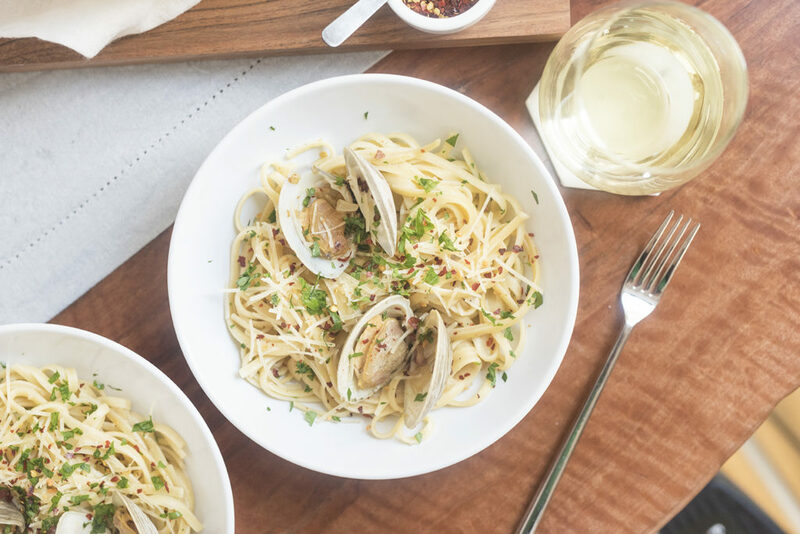 You don't want to overcrowd the pan by layering the clams on top of one another so cook in batches if needed. Place the lid on top of the pan and let it cook for 6-7 minutes. The steam created from the liquid will open up the clams. 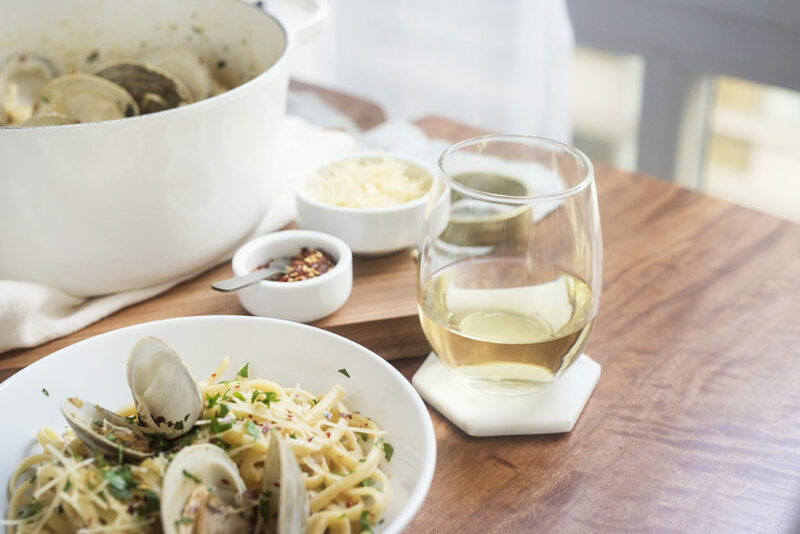 While the clams are cooking, bring a large pot of water to a boil. Add in the linguine and cook according to the package directions. When it is done, reserve 1 cup cooking liquid and drain the rest. Set aside. Check the clams after the 6-7 minute time frame and remove any that have opened. Set aside. Continue to cook those that have not opened for another 2-3 minutes. If they do not open after that then discard them. Remove remaining opened clams from the dutch oven and set aside. Add the cream to the sauce in the dutch oven and allow to simmer for 9-10 minutes stirring often so it does not burn. You want this to reduce to a thick glossy sauce. While the sauce is reducing, chop the parsley. Add the pasta, parmesan, parsley, salt and pepper to the dutch oven and stir to combine. Add the clams back in. Top with additional parsley and parmesan if desired. Serve immediately.